That is the message from officers in Rushmoor as we prepare to launch our knife amnesty next week (Nov 26). Amnesty bins are being placed at Aldershot police station and Rushmoor Borough Council offices, in Farnborough, as part of our ongoing work tackling knife crime. It comes three months after the last operation, which saw 15 knives handed in and taken off our streets. Once again the Rushmoor Policing Team is teaming up with Rushmoor Borough Council with this latest initiative. The bins will be secured by the entrances of Aldershot police station, in Wellington Avenue, Aldershot and Rushmoor Borough Council, in Farnborough Road, Farnborough, from Monday 26 November to Friday 30 November. The bins will allow members of the public to dispose of any knives or bladed articles without fear of any repercussions. 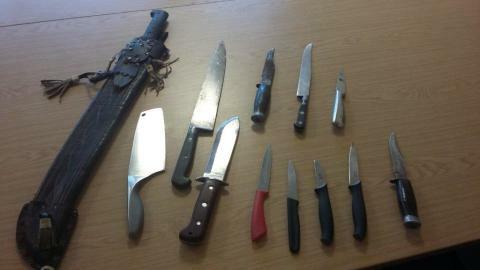 Sgt Phil Mayne said: “We were really pleased with the amount of knives we had handed in back in August. “Just one knife off our streets can save lives, so to reach double figures in five days really has helped to make our communities safer for all. He added: “Knife crime is still a priority for us in Aldershot and Farnborough and we are looking at various different ways to tackle the issue, which can often be drug-related. “We know some carry knives as a means of protection but sadly in reality it puts them at a greater risk of being seriously injured or killed. Councillor Ken Muschamp, Rushmoor Borough Council’s Deputy Leader, added: “Knives can be deadly – it is illegal to carry one, and individuals carrying a knife are much more likely to be hurt themselves than those who don’t, as events can quickly get out-of-hand.